This is a good recipe for people who think they don't like pheasant. I have yet to meet anyone who doesn't like dipping these crisp golden nuggets into garlic mayonnaise. If you can't get hold of pheasant, this recipe is equally delicious made with chicken. Make the mayonnaise in advance. Preheat the oven to 200°C, gas mark 6. Place the head of garlic on a piece of foil large enough to wrap it in and pour over a little olive oil. Wrap it tightly and roast for 25 minutes or until soft. Remove from the oven and let it cool until you are able to handle it. Squeeze out the flesh from each clove, mash in a bowl and set aside. Cut the pheasant into long strips about 1cm thick. Put the flour on a plate and season. Pour the eggs into a dish and put the breadcrumbs on another plate or in a plastic bag. Dip each strip of pheasant into the flour, then the egg, then coat in the breadcrumbs. 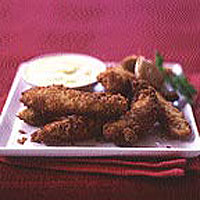 Heat enough oil in a deep frying pan to completely submerge the goujons (or use a deep-fat fryer). The oil is hot enough when a breadcrumb dropped into it sizzles. Fry the goujons in batches, for 1-2 minutes each, until crisp and golden. Drain on kitchen paper and season with salt. Keep warm until all the goujons are ready, then serve with the mayonnaise.